Among the paradigms revealed by the Masters of Light, probably this one will be the hardest to prove by quantum physicists and scientists. However, this is the real explanation about the spiritual planes from the scientific point of view. It’s logical that no scientist would ever admit the existence of the spiritual planes, but if we call them superluminous planes instead, perhaps they will realize that beyond the physical plane and the physical laws we all know about; there is a “superluminous” reality that goes beyond the realm of the senses. 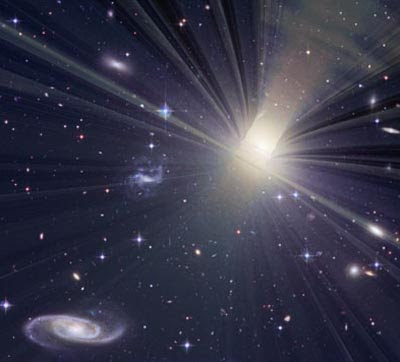 Physicists know that the limit of our physical universe is the speed of light, but there is a faster-than-light “reality” that scientists do not yet know about, and the answer to the matter would be the superluminous planes. Interlocutor: What is the limit of communication in the spiritual world? I mean to the transfer of spirits. For example, if I, as a spirit, want to go to the Pleiades, can I go there without any obstacle or there is something like a magnetic curtain that prevents me from to do so? Ruanel: There is no magnetic curtain. The limit is the speed. Ruanel: When we say that we move, we do it at a higher speed than the speed of light, for the simple reason that the spiritual universes, or, expressed more scientifically, the superluminous universes, vibrate at a speed beyond the speed of light. Then, when we move, that transfer is instantaneous according to your sight, because if the light takes 1,25 seconds to arrive to the Moon, we can take 1 second to arrive to the Pleiades. But if we had to move to the center of the galaxy, at 30.000 light years, we could take up to 1 minute to arrive there. We don’t reach instantly to the Andromeda Galaxy, which is at millions light years. Interlocutor: And how long would the spirits take to arrive to the Andromeda Galaxy? Ruanel: We could take 15 minutes or something more. That is to say, we have limits of speed. But compared with the slowness of the speed in the physical plane it is nothing. Interlocutor: Have you ever traveled to some place that took one hour for example? Ruanel: Yes, of course. To galaxies at millions light years distance. Interlocutor: While you travel can you think? Ruanel: The spiritual concept is always there. Undoubtedly we can think. And we do it in the same automatic way that you breathe. We cannot stop thinking in the same way that you cannot stop breathing, except when we rest. Interlocutor: Does a spirit get tired? Ruanel: We “rest” between quotation marks, because the spirit doesn't need to rest, but to restore its esoteric energy, to call it somehow. Interlocutor: While you "rest" do you lose the conscience, like when we sleep? Ruanel: No, we don't lose conscience because we don't need to sleep. But in some moment we leave the concept in blank that is something similar to what you call "leave the mind blank", and then we let ourselves go, enjoying completely that moment of perception. You would call to this meditation. Interlocutor: Returning to the previous topic, if you wanted to go to the end of the universe, Could you do it? I don't know how many light years would that be? Obviously it is a hypothetical question. Ruanel: What happens is that there is no limit, so to speak, because the universe is contained in itself. Interlocutor: I want to sum up my question. Is there some spirit among you that has traveled to a planet located at a billion light years for example? Ruanel: There are spirits that are travelers and they spend their time traveling. Ruanel: No, Tar is inside this Galaxy. As you may say, it is "local." But there are traveling spirits that change of galaxy continually. Even more, they don't embody, and they travel to know the customs of other incarnated beings. Ruanel: Keep in mind that, in spite of being so obvious, you have never written it: the customs of the various races are only in different incarnations. But I can contact with a spirit of ten galaxies beyond who has my same way of thinking and suddenly I communicate with another world where they breathe sulphur, where the inhabitants are nurtured by their sun through the skin, where the concept to make love doesn’t exist because they make it in a similar way that the plants make it: they channel the fluid and they send it. Interlocutor: Would you have some inconvenience in communicating telepathically with a spirit located at millions light years? Ruanel: Yes, because when the distance is long the telepathic communication is affected. I have communicated with spirits of this galaxy which has 100.000 light years distance. I have not tried beyond of that. Interlocutor: Does the Master Jesus have traveled outside of this galaxy, for example? Ruanel: Correct, he has traveled with this vessel to another galaxy. Interlocutor: Let’s see if I understood. Is it something like the occasion I traveled to Germany? I mean that I could have also gone to Russia, but I didn't do it. Ruanel: It is something like that. Entity that came to dialogue: Morganel Thetan of Manuel M.
Interlocutor: Morganel, how does a spirit or an angel do to move in the physical space? Is that unit of “energy-conscience” capable to interact with the vacuum? Morganel: The vacuum and supra-energy. If I suddenly want to move, I conceptuate, I cannot tell that I visualize because I don't have eyes and if I say that I visualize it is for you to understand it, I conceptuate myself at certain distance. For example: I want to be in another planetary system. I conceptuate myself in that planetary system. This entry was posted at Saturday, January 09, 2010 and is filed under Morganel, Paradigms . You can follow any responses to this entry through the .